A striking specimen tree and one of the oldest species of tree, dating back to prehistoric times. Biloba trees can grow to 25-40 metres tall with a spread of about 9 metres. The form of the female tree is wider than the more columnar-shaped male tree. The canopy of mature trees is more irregular and spread out in form compared to the pyramidal shape of younger trees. 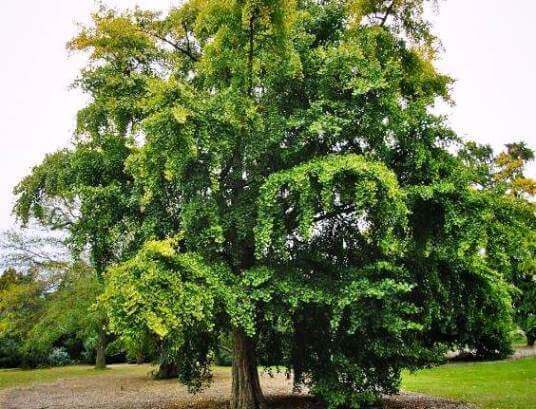 Biloba trees produce edible yellow fruit containing a seed surrounded by a smelly outer flesh. Seeds can be steamed or roasted before eating. The light green, two-lobed leaves are fan shaped turning yellow in autumn. Thrives in moist, well-drained, deep soil and positioned in full sun with protection from wind but is adaptable to most soils and will tolerate drought, pollution and salt spray. Beautiful as a specimen tree in gardens or for bonsai. Gingko is also widely used in herbal medicines.